Roza is a major character in VayneLine, she is the girlfriend of Reno, is tall, attractive, has an acerbic wit and is skilled with technology. 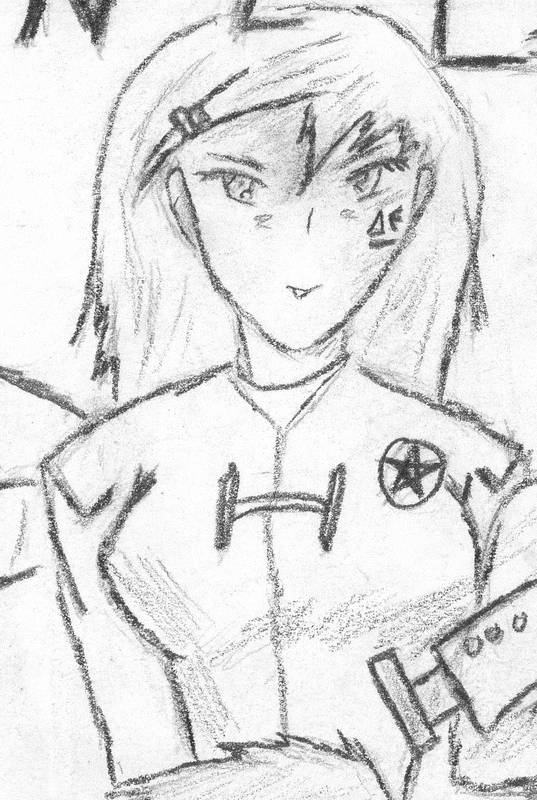 She serves as the communications on the Blue Dragoon given her fast intelligence and her technological affinity. Roza is smart, tall, attractive and witty, currently Reno’s girlfriend. Roza spent a large part of her life on Ares (Mars after terraforming) and grew up as a farmer – a history Gauge is slightly envious of. Roza has a high degree of affinity for technology and is constantly up to date on news from less than savory sources. It is best to think of Roza as a futuristic hacker. ‘Amazonian’ in appearance, she is very tall, built attractively and has a tanned, lightly intimidating appearance. Like all AGEd Solarians she has a physicality that would leave modern humans far behind, but her strengths are more mental. At some point on Ares she was victim of a farming accident that she lost her arm in a grinder. Instead of getting a more normal ‘bio amp’ (essentially a grown/enhanced biologic limb) she got a cybernetic one. It still has the appearance of a normal arm, but is composed of various shifting cords and cables. The first time her arm exploded into cords to hack through a door it scarred the others, and she joked ‘You should see what else I can do with this’. She is similar to Gauge with her cybernetic hand, as many people do not like cyber technologies given the war with the Burn. Roza has been the girlfriend of Reno for an unknown length of time. It is interesting as Roza is very sensual and flirty openly with other guys but Reno pays it no heed. There is a history between the two of them that runs far back and much more than meets the eye. Roza is one of the three tallest members of the Blue Dragoon crew: behind only Reno and Gauge. Roza really like wind sailing and is good at it. Wind sailing is a very popular sport on Ares given how much of the planet has shallow oceans and stiff breezes.